How Do You Become a Nurse Anesthesiologist? Since it is one of the most lucrative positions in the nursing field, you may be wondering how to become a nurse anesthesiologist. Besides the tangible rewards of this nursing specialty, there is also the satisfaction of helping patients in need of anesthetics. Nurse anesthesiologists assist patients in a wide variety of settings and in all kinds of surgical procedures. The job has a long and valued history and there is a great need for qualified and well-trained nurse anesthesiologists today. In order to become a nurse anesthesiologist, you must complete a four-year, bachelor’s level degree in nursing (BSN) and pass the national licensing exam to become a registered nurse (RN). 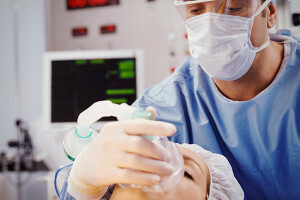 Then you will go on an advanced, masters level degree in nursing from one of the 114 accredited nurse anesthesia programs that you can currently find within the U.S. Once you have graduated, you will also need to take and pass a national certification exam in order to become certified as a nurse anesthesiologist. RNs can gain experience in a variety of types of nursing. If you know you want to go on to become a certified registered nurse anesthesiologist (CRNA) then you will want to gain experience in acute care by working in a hospital emergency department or in a critical care unit. You will need to have at least a year of experience in acute care in addition to your advanced degree and your certification. Once you have your certification, you will also need to commit to ongoing continuing education in order to have your certification renewed. There are several requirements for recertification, including obtaining at least 40 hours of related continuing education every two years. All of this may seem like a lot of preparation, but the role of the nurse anesthesiologist is a highly important one. According to the American Association of of Nurse Anesthetists, CRNAs are the safe administers of over 34 million anesthetics annually. A lot of patients are served by this practice, including a number of patients in rural hospitals where nurse anesthetists are often the only providers of anesthesia. Anesthesia helps patients who need pain management after trauma, during surgery and during childbirth. Anesthetics helped to revolutionize surgical procedures in the 1800s, and today it continues to be an important service, one that has grown even safer since the 1980s. If you become a CRNA, you’ll have a chance to work with all kinds of other healthcare professionals, collaborating with surgeons and other types of doctors to help manage pain for patients in need of surgical procedures. You might end up working in a hospital in a surgical or obstetrics department, in a pain management office or a surgical center, or even in the offices of other types of doctors such as podiatrists or dentists. The high compensation for nurse anesthesiologists, as it is regularly cited as the highest paid of the advance practice nursing (APRN) roles, is commensurate with the high level of responsibility and care that nurses must bring to the job. If you decide to become a nurse anesthesiologist, you will discover many satisfactions in this important role.